People living near the Ann Arbor welding supply are being allowed back into their homes Friday morning following Thursday's massive explosions. 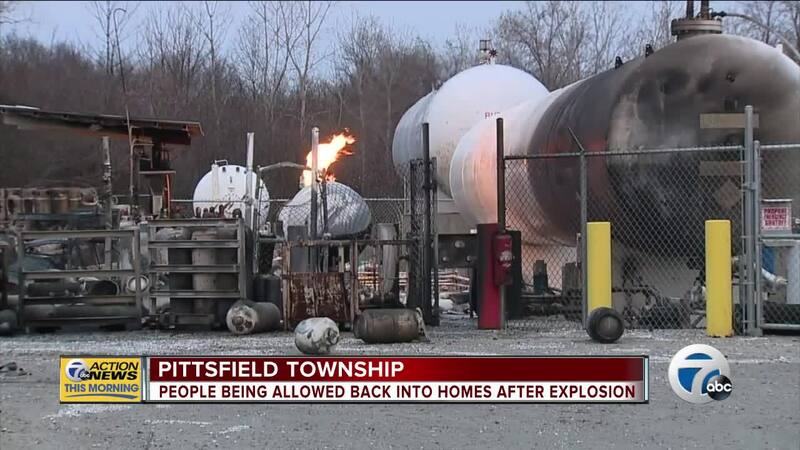 PITTSFIELD, Mich. (WXYZ) — People living near the Ann Arbor welding supply are being allowed back into their homes Friday morning following Thursday's massive explosions. A fire caused multiple explosions leading police to call a one-mile radius evacuation. Roadways including US-23 and Carpenter Road were temporarily closed off. Action News Reporter Ali Hoxie has been told the flames are expected to die out by 5 a.m. The CFO of Ann Arbor Welding told us a fire started in a part of the facility known as the "tank farm," causing the explosions. We're told the tank farm is ruined. "I was thinking it was the construction...there's something going on," said neighbor Stephanie Villalobos. Officials say no one was hurt during the explosion.